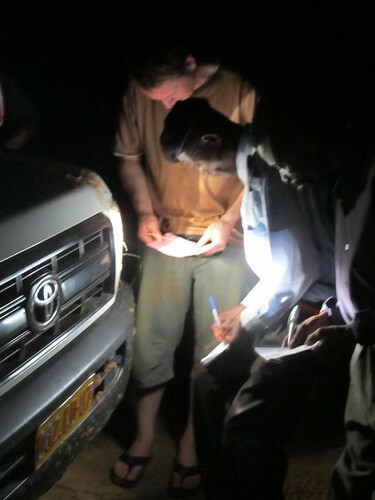 In June 2012, we, a small team from the German embassy, took a ten-day road trip from Kinshasa to Lubumbashi on National Road No.1. This proved the road was still negotiable – at least during the dry season. 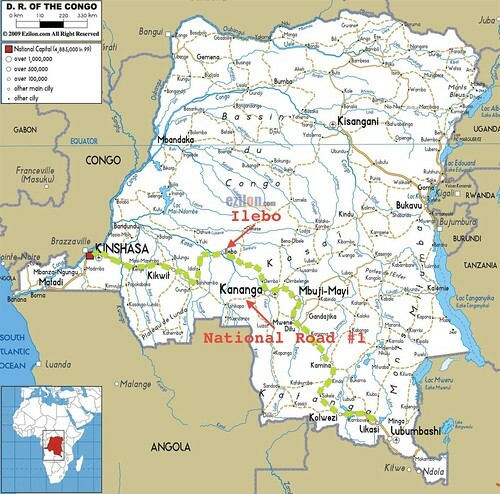 In fact, the road –considered the most important in the country – is rarely used the whole distance from Kinshasa to Lubumbashi, but only in shorter segments. 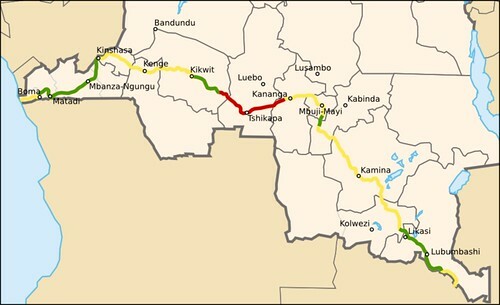 This 2006 map of RN1 shows three categories of road between Kinshasa and Lubumbashi: passable (green), bad condition (yellow) and impassable (red). The road has not improved. Before our trip, nobody could even tell us whether it was possible to do the whole distance. Office des Routes (the national bureau of roads) did not have the necessary information, but promised to inquire at regional offices. They eventually gave us five categories of road: very good (paved), good (dirt road with some potholes), medium (dirt road, deep vehicle tracks and many potholes), bad (deep sand, mud holes, extreme vehicle tracks, expect to be frequently stuck), very bad (almost impassable). This proved to be quite accurate. The Office des Routes estimated fourteen days for the 2,600 km trip. It calculated several involuntary stops for probable stuck or broken down trucks blocking the road. In this case they informed us you wait for the repair or you clear a track through roadside thicket. In fact, we needed only eight days of driving and spent an additional day in each Kananga and Mbuji Mayi. Our fellow travelers and their broken down truck. Basil, our infallibly adaptable chauffeur, in blue shirt. Our team was composed of Ambassador Peter Blomeyer, his wife, Sabine, the attaché for cultural and economic cooperation, Thomas Witzel, as well as a resourceful driver, Basil. We went in one jeep, taking turns behind the wheel. Rules of the road: we shared more than just the driver’s seat. Sabine, patient at the window as Basil oversees refueling. National Road No. 1 starts at the port town of Matadi in the far west of the country and runs from the provinces of Lower Congo to Kinshasa, through Bandundu, whose economic center is Kikwit, to the central provinces of West and East Kasai with their capitals Kananga and Mbuji Mayi to the second biggest metropolis of Congo, Lubumbashi, capital of Katanga, former Shaba. Dry season burns on the hills beyond Kinshasa. 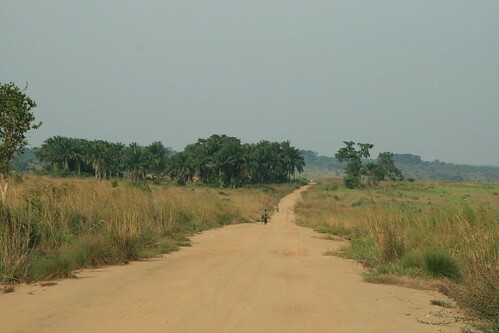 We traversed almost all landscapes Congo has to offer. 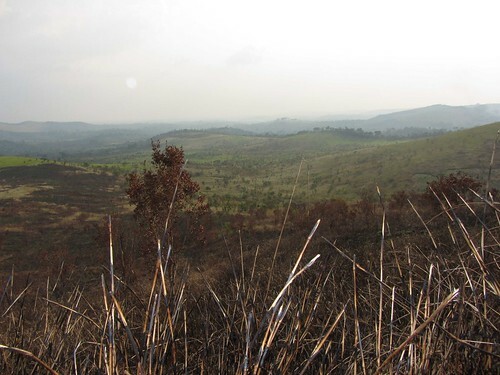 After leaving Kinshasa, we climbed into hills, which, after intensive logging, are scarcely wooded; only in small river valleys the vegetation is still dense. In Bandundu, we entered the savanna belt that circumvents Congo’s rain forest basin. The scenery widened, vegetation got sparse on meager sands, lush only close to streams. 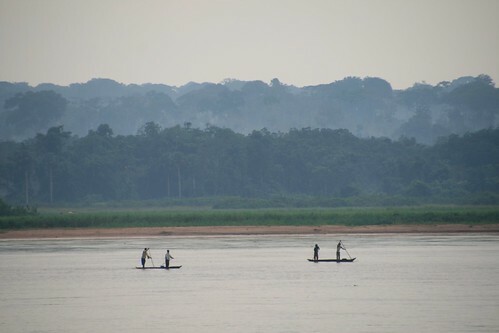 After crossing several smaller rivers we reached the mighty Kasai – main confluent to the Congo River and itself one of the biggest rivers of Africa. The great Kasai where forest meets savanna. Rain forest comes up to its northern bank. Across the river, the road proceeds through the Kasai provinces heading East into fertile hilly land and again through savannas. Savanna met us in Katanga, reaching down south to the African high plateau rising to become mountainous, woody and cooler. Forest, savanna and the intermingling of both. The road has few towns that feel urban. Small towns do not even have gas stations; we were supplied from canisters with, at times, polluted diesel. Kikwit, economic center of Bandundu, beautifully situated at the riverside, has only agricultural production; Ilebo, a port town on Kasai river, is mainly important to reload from railway to barge. Everyone detours through Ilebo as National Road 1 is impassable through Thsikapa. Kananga, provincial capital since colonial days, is seat of an emerging university that cooperates with the German university of Aachen; Mbuji Mayi, a rather lively agglomeration , grew up around huge diamond fields that now lie idle due to lack of investment. 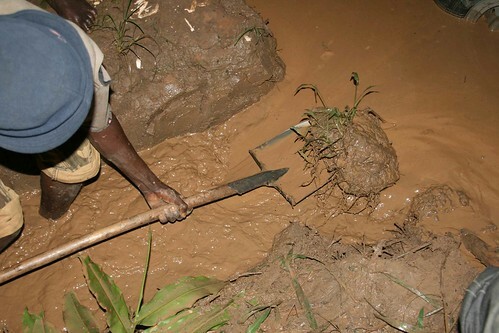 Artisanal mining has exploded all around it; Mwene Ditu, not far from the border between East Kasai and Katanga, is an intersection of the railway from Lubumbashi to Ilebo and a road from Lake Tanganyika to Angola. We never had the impression that we were on a major road connecting vital economic centers. Unfortunately, west from here it is impassible. In Katanga we found some lovely garden-like towns, like Kamina. We deviated from National Road No. 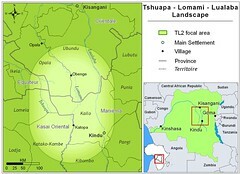 1 to Kolwezi, the Congolese copper capital. Not very pretty but very busy. Lubumbashi is an appealing place, situated at an airy thousand meters altitude, blessed by a mild climate, a lake in its center and a remarkable zoo, but in the heart of the city rises a mountain of copper slag from the Mobutu era which a Congolese company has acquired for extraction. Major intersection in a small village. 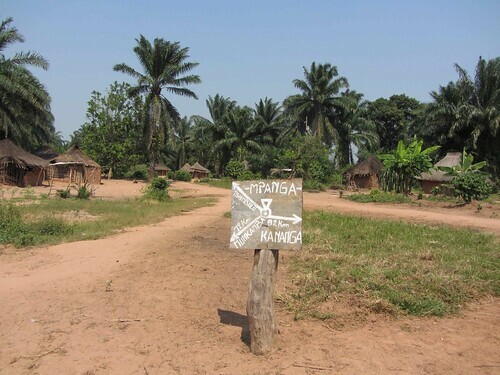 Villages, one like another, follow all along the road from Kinshasa to Lubumbashi: huts with palm roof, mostly made of branch frames filled with clay, less often erected with clay bricks, sometimes circular, sometimes rectangular, mostly brownish, only in higher altitudes whitish. Inside there is usually a single room with pounded clay floor and sleeping facilities for the whole family. Outside the hut, the kitchen is but a few stones, within which a fire is lit to prepare meals. The toilet, a hole in the ground, is screened by wattle or matting, as is the bathing area. Beside the hut, manioc is almost always being dried, pounded or prepared. In surrounding fields various vegetables, peanuts, sweet potatoes and corn – along with manioc – are cultivated. 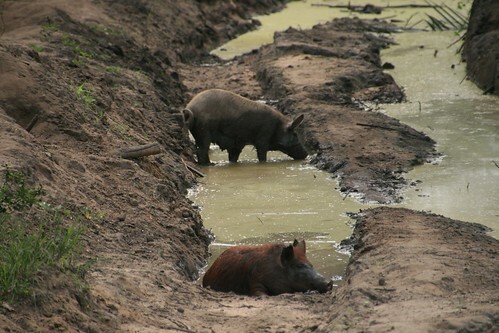 Small livestock including chicken, ducks, geese, goats and pigs complete the subsistence economy; sometimes dogs and monkeys suggest the importance of hunting. 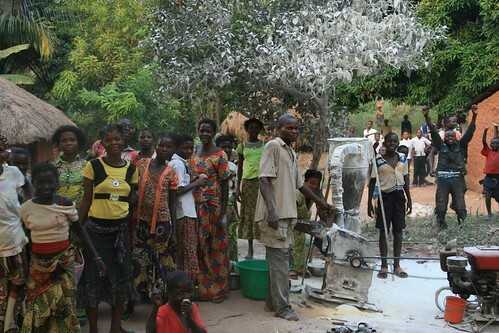 Local manioc mill is the center of activity. 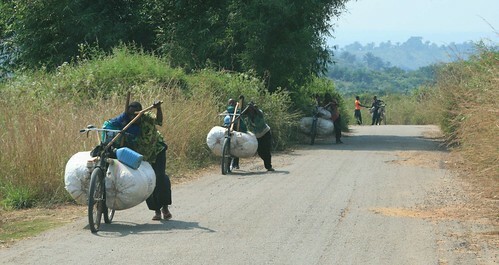 Women haul firewood as well as water from sites that may be far from the village. 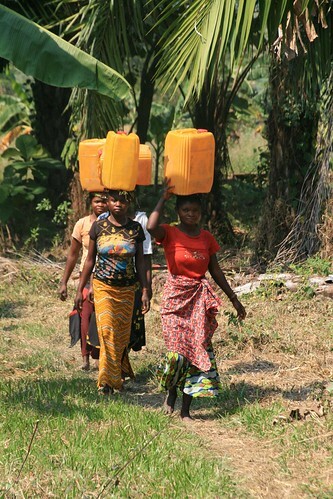 The water itself is often dark; they go to surrounding creeks to wash clothes and dishes. Some places have small manioc mills run by youths sitting in white clouds of manioc powder. Countless kids create a vivid, turbulent atmosphere; playing fields are more common than public schools, and no gift guarantees more jubilation than a football. Footballs were a welcome gift in villages. Old missionary stations and bishops’ seats are beautiful sites of a bygone era. 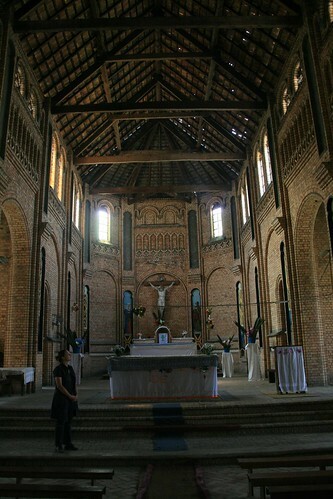 The mission of St. Jacques in Northern Katanga with a large cathedral, a long parsonage, numerous side buildings, stables, barns and garages, a remarkable school complex, vegetable and fruit gardens and a fishpond school is a beautiful example. Once upon a time a huge priest seminary, today there is only one Indonesian father with a housekeeper and a caretaker watching over the fading glory. Sabine appreciates the silent glory of a bygone, Catholic colonial era. The road’s main traffic is trucks, all of which look like they have been recovered from scrap several times already. Merchandise is piled up several meters high and on top of it sit the passengers, as many as thirty persons. In this condition, trucks can only creep forward, each contributing to the continuous deterioration of the road. Car tracks become so deep that the road is often impassable even for Jeeps. Mud holes are constantly dug deeper. Vehicles plow their way through the thicket next to the road creating new paths, and where this is not possible longer deviations are found. Carved out sand paths feature up to six lanes. 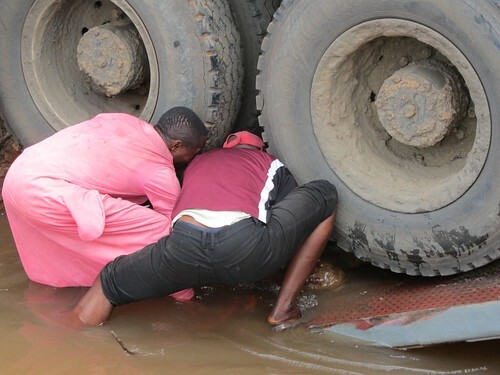 Trucks constantly break down and block the way until repaired; this can last up to several days. Fallen truck blocks the road. 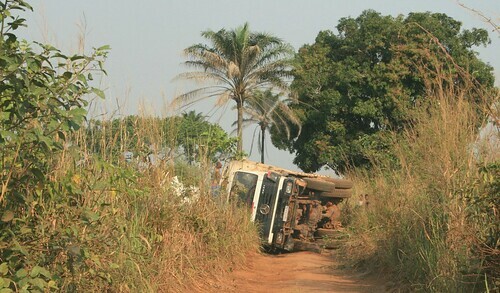 A truck we met had tipped over on the rutted road; two of its passengers were injured, one woman badly. She had been laying with interior lesions for two hours until we came and drove her to the next hospital. The driver had run off for fear of lynching. This is typical. The driver informs the owner who has to sort the situation. This owner was unlucky: due to a series of breakdowns the truck had covered only three hundred kilometers in seventeen days. We, like all other travelers, depended on courtesy of the road. Trucks were also the most important help when we got stuck. They bailed us out of mud and sand, and the code of the road was adamant: this was done for free, mundele (white persons) were no exception. People were extremely helpful; advisers and aides appeared as soon as there was a problem. For each problem a solution was found. Combined effort got us out. In one case we could not dig ourselves out because the track was flooded as high as the bottom of our auto body for about twenty meters. In only one hour volunteers had dug a channel draining down hill and liberated our car. In another case we got stuck in a stream so this method could not be applied; this time a log was pressed in between a truck and our car, and the truck pushed us out. Streams are regular obstacles on the road. Most bridges do not inspire confidence; their iron frames are badly distorted, and some of the wooden planks are porous as Swiss cheese. Today’s overloaded trucks aggravate the dilapidation, their weight beyond the imagination of colonial construction engineers. So bridges break frequently. Ferries, too, are unreliable. 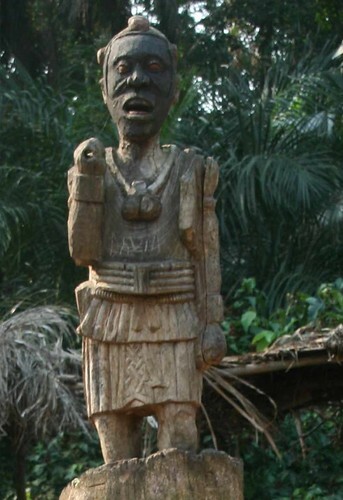 When we arrived at river Kasai, the ferry had already been waiting two weeks for a spare part as big as the palm of a hand; we became popular because it was our presence that finally brought the piece. When eventually it was fixed after half a day of work, a truck’s frame got hung up on the ferry when leaving it, its wheels in the air. Another two hours of discussion, various attempted solutions and multiple suggestions were necessary before the truck, with some brutality, was wrenched from the ferry. Getting the truck off the ferry. There are few passenger vehicles, almost no jeeps, and only a few motorcycles, always with three or four passengers. Trucks dominate the road. They deliver to bigger towns of central provinces industrial products such as machines, motors, wheels, tools, spare parts, and fuel as well as merchandise of daily use including salt, sugar, soap, clothes, batteries etc. On their way back they take agricultural products, such as manioc flour or corn, palm oil, charcoal, salted fishes, peanuts, vegetables, bananas. And always, they also carry passengers. Bicycle “tolekistes” a vital part of economy. To smaller towns and villages, it is Chinese bicycles that carry merchandise. 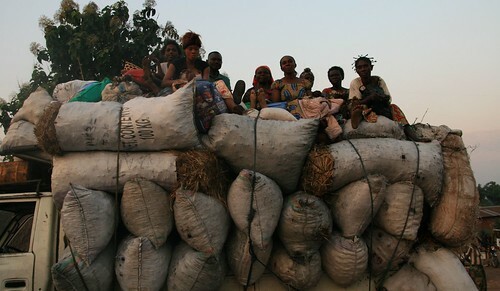 They are loaded high with two to three hundred kg sacks of manioc, corn, charcoal or other rural products. 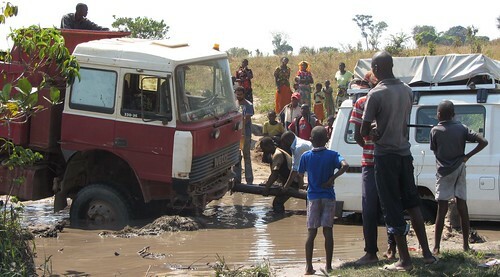 They push them through sand and mud for a week or more to get from village to town, a perspiring business; on their trip back they bring merchandise from Kinshasa or Lubumbashi. Finally it is women, colorfully clad in panyas – cloth with African motives made in China – that are responsible for the most local transport of rural products from fields and woods to villages and rural markets. Children, too, carry loads from village to village. But the ubiquitous transport is on the heads of women. From Ilebo at the river Kasai to Lubumbashi, a railroad track parallels the road. Once a week a freight train connects the two towns, once a month a passenger train, all old, robust trains from South Africa. They carry the same merchandise as on the road. In Ilebo, the merchandise, reloaded on barges, floats down the Kasai to the Congo and from there to Kinshasa; in Kinshasa it can be returned to the railway to head for the port of Matadi. The economic exchange between Lower Congo/Kinshasa and the southeast, however, has long sense ceased to be of market significance. Cellular networks cover most parts of the road; towers dot the savanna. Congolese towns depend on these as the main method of communication. Most people were friendly and helpful, at times with enthusiasm, especially children. A few asked for help but only once did we run into blackmail: some highwaymen blocked our passage through a river with rocks to get money; in our case, they were unsuccessful. The numerous makeshift police barriers never caused a problem. At provincial borders though there is a lot more bureaucracy than at European state borders: identity cards and vehicle papers need to be presented, lots of numbers are registered in huge books. 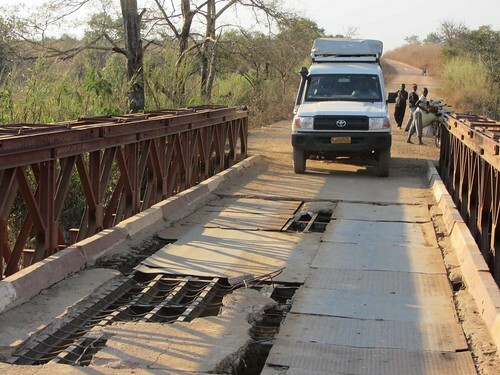 World Bank and EU have set up an ambitious rehabilitation program for infrastructure in which the road between Kinshasa and Lubumbashi has priority. However, it will still take some years until realization. Already some bulldozers stand prepared to start work, and when asked why the most difficult parts of the road had not yet been tackled, the answer was: no fuel. 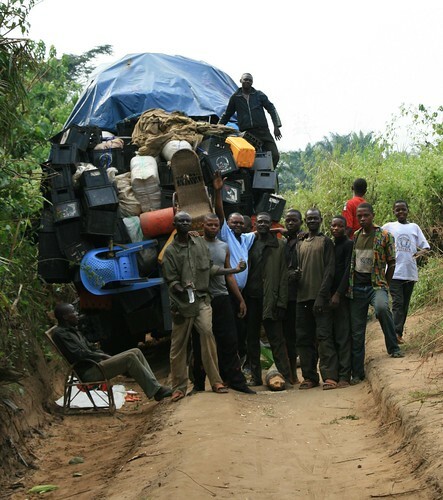 This trip illustrated for us the extent to which different parts of Congo are diverging. Kinshasa and Lubumbashi are two gravitational centers; the same is true for the important towns of Goma and Bukavu in the far East; all lie at the periphery of this huge country. An exchange of merchandise between them barely occurs; each Congolese center orients towards the outside, to other parts of the continent. The center of the country, due to the precarious state of infrastructure, is only poorly connected to these major centers. The exchange of merchandise is so arduous that it remains minimal. This is our impression after travelling over the most important artery of the country; the hinterland is practically excluded from participation in traffic and exchange. This only compounds the extreme poverty of the Congo. The German ambassador is about to leave us for a new posting in Kosovo. As fellow travelers, we will remember Peter and Sabine all along our roads! Update: Another Bridge Down on the Road through the Okapi Reserve. This entry was written by Terese Hart, posted on 2012-10-04 at 2:23 pm, filed under Guides and how to. Bookmark the permalink. Follow any comments here with the RSS feed for this post. Post a comment or leave a trackback: Trackback URL. 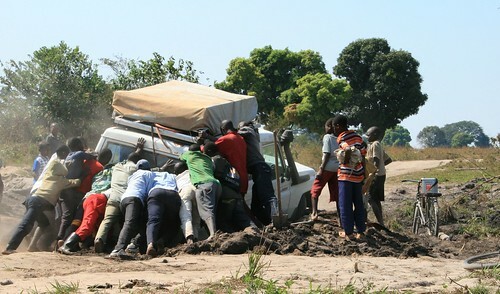 Excellent review about road transport in D.R.Congo. True, the conditions encountered between Kin and L’shi are very similar throughout the whole country. 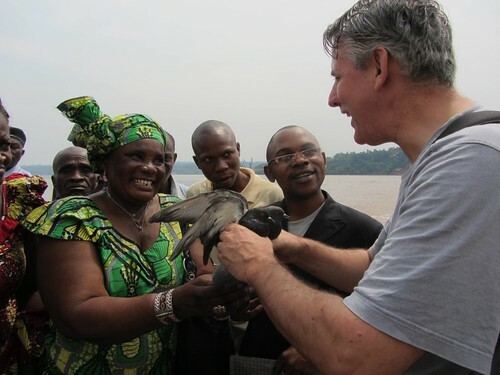 Understandably, the Congo river is and has always been “the most important artery of the country”. What a terrific “final” adventure for our friends Peter and Sabine. Bon voyage and all the best in your new post: Kosovo. It seems you must wait a little longer for that posting in a Spanish-speaking country. It is hard to imagine with the state of the world economy, that this main artery route will soon be very much improved for the Congolese. Excellent article Terry. Thank you. Nothing like a well recounted road trip. One most of us could never imagine taking! having CD plates certainly helped smooth your passage! i cant imagine what the journey would have been like without them. amazing trip though, i hope to do it one day. Amazing to see John and Terese up to their usual groundbreaking work in the bush. Merci mingi! 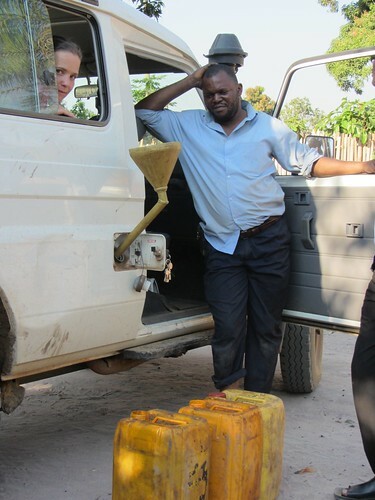 We did the same journey in 1990 or 91 to deliver new Peace Corps vehicles to all the regions – what an adventure! I did a study of the transportation challenges for my job at the US Embassy. The slides and crazy details are better shared over a beer! I think it took us 10 days, including a day spent waiting in the rain for the bac at Ilebo. Glad to know the trip is still doable, 20 yrs later! what is the safest plce in cong drc can one think of investing. secondly how are underground water projects being handled in this country?